Since we live in such an awesome time – the possibilities of competitor analysis and how to approach it are endless; and while there are softwares, SAaS’s, and agencies that can help you rock this [afterall these are the “anti-rockstars” (or rockstars – whichever word you prefer!) and spend their lives rocking success in this category]. However, if you’re wanting to at get a foot in the door and see what’s smelly – there’s plenty of free & frugal resources as well. Ready…. Set…. Let’s Go. 1.) YOU GOTTA KNOW ‘EM TO SHOW ‘EM (UP, THAT IS): I am constantly telling companies to go sign up for SpyFu.com It’s $79 a month – but even the bit of information that it gives you for free, is priceless! 2.) DEFINE YOURSELF: Now that you’ve done a brief ‘self analysis’ in comparison to your competitors – find out what your targeted demographic is searching for. Visit Trends.Google.com – The keywords that I am being found for – how common are they? Are they being searched for, for anything other than me? (Nope!) I then know to check out things like “Digital Marketing” or “Inbound Marketing” (or in Dalzell’s case – “Augusta Georgia Landscaping” or even “Landscaping” in general). 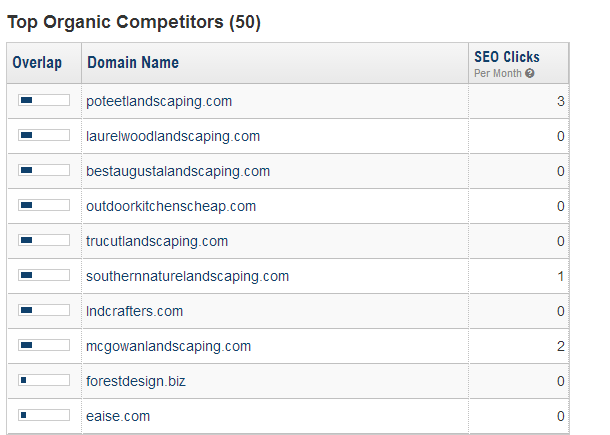 Go back to SpyFu or KeywordResearch and measure my desired keywords – if it’s “Augusta Georgia Landscaping” – finding out who is ranking for those keywords specifically – and seeing what they are advertising/doing organically to build traffic for those keywords. BUILD and pay! BUILD and pay! BUILD AND PAY! I can’t stress this enough – especially for a local/small business such as Dalzell – there is NO excuse for not having paid advertising – their competitors are all running campaigns on Google Adwords & Facebook! There competitors are ALSO all building rich content within their website via traffic linking and index’s/folders – and that is crushing any chance Dalzell has. This is a high level overview of a task that is completely essential however not one easily grasped quickly. While building familiarity and understanding of concepts allows you wisdom; I would leave success to the pro’s in the industry! Go research yourself! “ViewSource” your own page and see what your page is showing for your Meta tag’s. Check yourself out on KeywordResearch or SpyFu (or SEOMoz or Hubspot or many of the resources out there!). “ViewSource” your comeptitors pages – what are they tagging on their pages? Check out their PPC (paid per click) campaigns – what demographic & keywords are they targeting? How much are they spending? What is their conversion rate? Etc. Just remember – ignorance is never bliss when it comes to your business’ growth & success! Follow me on Twitter + Facebook + LinkedIN for more!